In Dwarka, New Delhi a Non Governmental Organisation “ Human Research & Development Organisation, New Delhi organizes Delhi L’il Cricket League. Inauguration of DLCL Cup 2012 is successfully finished. The 1st League Match of Cricket Tournament DLCL Cup 2012 has played between Delhi Gold (Issan Jassal , Ashutosh Chaoudhry, Himanshu Shokeen, Jatin Nagrani, Karan Kanojia, Price Singh, Rahul Phogat, Shivam Udar, Suraj Mehta, Vibhor Sehgal, Vinod Singh) and Delhi Royal ( Keshav Kr. Jha , Aniket Tanwar, Ankit Bisht, Ayan Sharma, Manv Arora, Mohit Dhall, Rajan Mishra, Rishav Lamba, Rudra Kumar, Shreekar Jha, Vicky Kumar, Yash Negi) As a chief Guest Shree Mahabal Mishra has given his best wishes for both Teams. 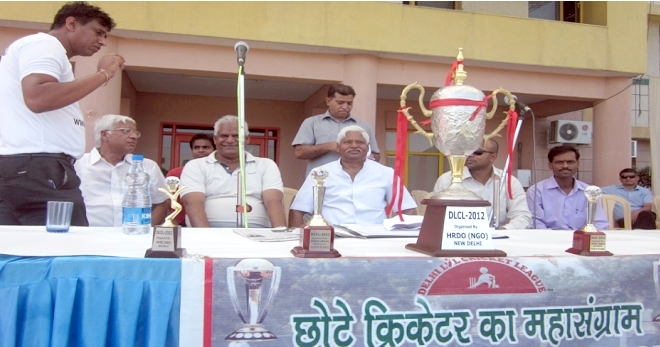 During the inauguration of this tournament Mr. Jagat Sigh, Former Runji Player , Mr. Sumit Sigh, Runji Player, Shree Jayjay Ram Singh, Mr. Ganesh Dutt, HRDO President, Mr. Manoj Thakur, VP- DLCL was present at stage. It was first qualifying match, Delhi Gold captain Mast. Issan Jassal win the toss and elected to Bat first. Delhi Gold scored 168/9 in 20overs. Prince Sigh scored 42 runs where Jatin Nagrani taken 3 wickets in three over by spending 7 Runs. Match of the match Jatin Ngrani cheers this win with his team and captain. Mr. Ganesh Dutt, Chairman of Delhi L’il Cricket League announced that all leage match and Semifinal match will be played in Basava International School and Final Match will be played at Talkatora Cricket Ground, New Delhi.